How can I protect my child from gadget addiction? 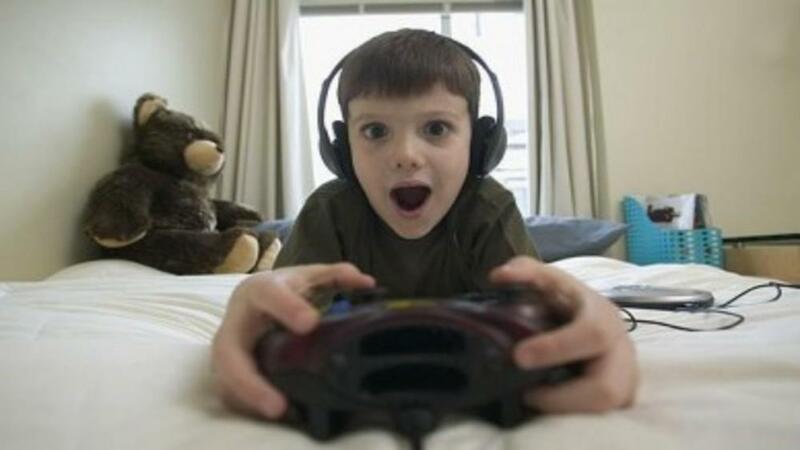 How can I protect my child from the various distractions like electronic gaming, television and internet!! My child is in front of the television or the computers the for whole day! He doesn’t listen to me anymore! His grades are falling… Punishments don’t work anymore. He is turning to be a rebel! If we try to threaten him, he threatens to call the cops and put us behind the bars!! Too much of social awareness I guess! How do I tackle this situation? Sounds too familiar? These are the kind of questions that I generally face in the school PTM’s at primary level. At times, I do face the same situation at home too. My prompt reply used to be, “As parents, you have failed. How can you as adults not exercise control over a ten-year-olds TV and play time? Most parents generally agreed to their failures and some, I realised had valid reasons for the same. Working parents failed to have control over what their children were doing, during after school hours. The children took advantage of this situation and enjoyed lazing in front of the TV or the computer, gaming to glory. The situation was even worse in joint families, where the television gets switched on at sunrise and it continues playing well beyond midnight. Parents can’t interfere with this as it will spark off many other ugly situations in a joint family. Moreover, when it comes to grandparents, they have a right to relax and keep themselves occupied at least with that idiot box which is their only companion at that age. Now, with the problem being identified, the parents were looking up to me for magical solutions! After all, I was their child’s teacher! This was their only child or only the second one they have handled but I have been handling, at least, forty such kids in every class I walk into, and a different set of forty every academic year!! Phew, I had to do something…After giving it a serious thought, I came up with the following suggestions. # Explain to your child, that according to the laws of nature, too much or too little of anything is never good. Be it food, water, rest, play or even work. This can be explained even to a four-year-old with simple illustrations. Give the child three simple potted plants. Help him water one plant six to seven times a day, water the second one adequately only once in the morning or evening, and give the third plant only two teaspoons of water each day. Do this for a month. Observe the plant regularly. Your point is proved! Make the child observe and comment on the same. After all, seeing is believing! Then guide him towards believing that too much of TV, games, rest, food or even work is bad for him. Once this is achieved, guide him towards making a timetable for after school hours. # Help your child make a timetable for himself for his after school hours. Involve your child in it. Guide him to include slots for TV, playing outdoors, written work, studying etc (if your child insists on playing computer games, trade it for the TV slot – he can’t have both). Computer games can be given a slot during weekends. Working parents can ensure that slots like tuition, written work, TV and playing outdoors all finish before the parents reach back home from office. (parents should plan the written work a day before). Involving your child in the timetable making process, and giving him some liberty in deciding his routine, makes him feel special, and motivates him to follow it, rather than we forcing a schedule on the child. # Once the timetable is made, paste a copy where your child can see and encourage him to follow it religiously. # Motivation is a big factor. Just like we get incentives at our offices, children also need some incentives and rewards. So reward your child with his favourite chocolate, chips or ice-creams on a daily basis for following the planned timetable. Keep some bigger weekly and monthly rewards too. (some movie or toy- you know your child better) Punishments and rewards when promised must be executed! # You may also enroll your child in some constructive classes like music, dance, drawing, yoga etc during your office hours, so that your child’s time is used wisely in your absence. # If parents stick to their motivation and rewards, I am sure this timetable concept will go a long way and teach the child to be independent and self-disciplined. As the child grows older, the timetable can be modified to suit the child’s needs. Believe me, motivation, appreciation and rewards work a lot better than the traditional punishment way. It also keeps the general mood of the family, happy and stress-free! ‘School Uniform Etiquette’ – A Mother’s Guide. Teachers Of The “Google Era” – Can Change Lives!